All of our plants are guaranteed to be top quality, true to name, firm and healthy, carefully packaged and shipped. If your plant has received the recommended care and doesn't perform to satisfaction within 30 days, please let us know and we will replace it or give you a merchandise credit. If you have any concerns about your order, we must hear from you within 30 days of receipt of your shipment. Plants ship separately. Sorry no gift wrap available on plants or trees. We value your business and want you to be a repeat customer. We hope that you will recommend us to your friends and colleagues. • We collect the e-mail addresses of those who communicate with us via e-mail, place an online order, subscribe to our email newsletter or request a catalog. • The information we collect is used to improve the content of our Web page; to notify consumers about updates to our Web site, new products, special offers and seasonal gardening tips; to contact consumers for marketing purposes and to answer customer inquiries. • We do not make your e-mail address available to other organizations unless you have expressly given us permission to do so. • In addition, you may receive mailings from other reputable companies. 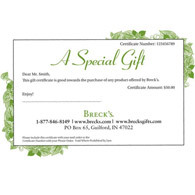 • If you do not want to receive e-mail from us in the future or if you do not wish to receive mailings, please let us know by sending e-mail to us at customerservice@brecksgifts.com, or calling us at 877-846-8149. • Please provide us with your exact name and address and we will be sure your name is removed from the appropriate list.